Norway's first Nebelung litter is born ! 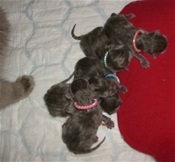 During the early hours of 24th November 5 kittens were born. Nova did great, and within 3 hours they were all born without any problems. The nesting box was right beside my bed, and Nova woke me up at 2 o'clock. She was very determind that I stayed right beside her all the time. When I tried to go and get some supplies, she would follow me, even if the contactions was already working. So I had to get her back into the nesting box and stay there to comfort and encourage her trough it all. She took great care of each kitten as it was born, but after four she seemed a little puzzled that they kept coming, but with the fifth she picked up again and tended to her newborn babies. There seems to be 4 boys and 1 girl, but I am still not 100% sure. They are weighed every day to make sure they put on weight nicely as they should be. Acey is very facinated with the little ones. She spends hours on my bed staring down into the nesting box. She is almost 10 months now, still likes to play, and they will be great playmates for her after they have grown bigger.